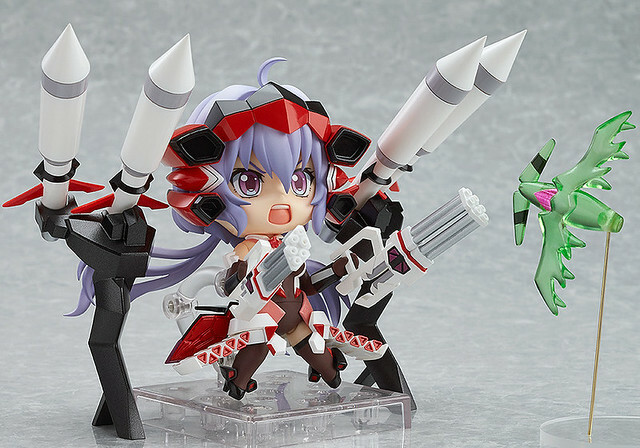 Here goes another Nendoroid from Senki Zesshou Symphogear: the owner of Ichaival, Nendoroid Chris Yukine, who has been available for pre-order since yesterday. From the popular anime series with a second season underway, ‘Senki Zesshou Symphogear’ comes a Nendoroid of Chris Yukine, the owner of Ichaival, the Second Relic Symphogear. She comes with three expressions including a smiling expression, shouting expression and swansong expression. She also comes with a huge number of powerful weapons including the ‘BILLION MAIDEN’ Gatling Cannon, the ‘MEGA DETH PARTY’ miniature missile launcher, the ‘MEGA DEATH QUARTET’ large missile launcher and even the laser cannons seen during her swansong! Her huge selection of heavy weapons is the main factor of her price bump to 6000 Yen. She is scheduled for January 2014 release. Ouch! As usual, pay a visit to Kahotan’s blog to see more pics of this powerful Nendoroid. This entry was posted in News and tagged nendoroid, symphogear, yukine chris.